Some months ago I saw a solicitation in, "Previews," magazine for a graphic novel that sounded very intriguing, "Tarantula." Published by AdHouse Books and featuring the work of Alexis Ziritt, Fabian Rangel Jr. and Evelyn Rangel, I looked at the preview artwork and immediately had my interest piqued. It is about how some surreal heroes (including the titular Tarantula) come together to fight a Satanic cult backed by a corrupt local Government that aims to potentially destroy the world. The comic almost sounds like a normal heroic-yarn with supernatural elements when you hear such a description, but if you were to think this at all blasé you would be horribly wrong as this is one of the weirdest graphic novels I've ever read--in a good way! I am very glad I reached-out to the publisher to request a digital copy for the purposes of review, in other words. The artwork within "Tarantula," is bizarre, trippy, and otherwise psychedelic. A simple conversation between characters can be fascinating thanks to how almost everyone in the book is drawn in such a strange way--be they bird-people, lizard-based, have geometric shapes for a head, or be other monstrous humanoids. Reading this tale of good versus evil feels like stepping into a druggy-haze when you start flipping through the book, with things just getting increasingly weirder as you go along with all sorts of creatures popping-up on the scene. It is a bit like watching an old 1970's exploitation-cinema movie that somehow has an unlimited budget for visuals as gorgeous as they are grotesque. Between scenes of gunplay, brutal fistfights, interrogations at strip-clubs, and all kinds of weird demon-worship this comic oozes with a grindhouse-esque vibe that I absolutely adored. 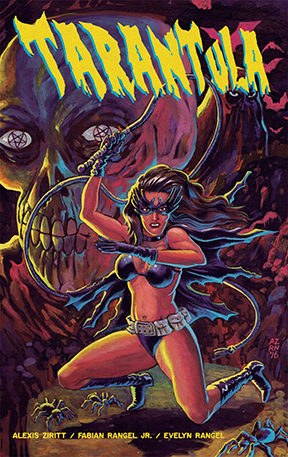 As I said, the plot ostensibly sounds simple with some heroes fighting some villains, but the story is so expertly paced and illustrated that it turns into a complex mix of drugged-out ideas that encourages readers to let their minds dip into the beautiful madness as Tarantula and her fellow heroes save the day. "Tarantula," is being published by AdHouse Books, as I mentioned, and will be for sale as of this coming Wednesday, June 7th, 2017. I encourage you to check out its listing on the AdHouse Books website and for sure recommend getting a copy so that you too can absorb its unearthly weirdness. Note: A digital copy of, "Tarantula," was provided for the purposes of review upon my request to the publisher.